Fast Food News: Breakfast at Chipotle? Could it be true? We hope so. We'll try and find out more and update this post. The Chipotle menu board in the photo above is in Terminal B of Dulles Airport (Washington, DC). You can read all about it at Dic Tailgate - A Virginia Tech Hokies Blog. Basically, we've been informed that vendors in the terminals at Dulles must sell some form of breakfast. In order to comply and have a location there, Chipotle decided to experiment. And evidently during Chipotle's last investor's call the possibility was left open to bring this concept to other locations! Breakfast Tacos - "Three soft corn or flour tortillas with scrambled eggs, meat, salsa and cheese or sour cream." Breakfast Burrito - "Flour tortilla with crispy herbed potatoes, black or pinto beans, scrambled eggs, meat, salsa and cheese or sour cream." Breakfast Bowl - "Crispy herbed potatoes, black or pinto beans, scrambled eggs, meat, salsa and cheese or sour cream." The 3 meat choices are Chorizo (naturally raised spicy pork sausage), Carnitas, or Barbacoa. The Chorizo being a new choice. Three of the salsa remain the same, but the corn salsa is replaced with a spicy onion-jalapeno salsa. 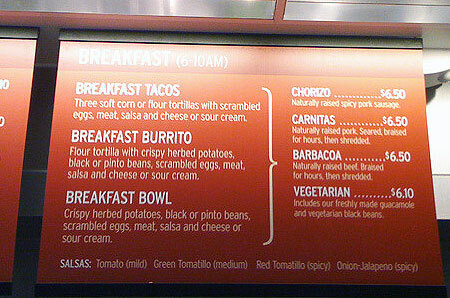 We can just hope that this breakfast menu spreads to other, non-airport Chipotle locations soon! I was just thinking today how I wished that Chipotle had potatoes in their burritos and now I know they do--far, far away from me. Hopefully their breakfast burritos go nation-wide. I just realized there is an extra salsa also ... note the Onion Jalapeno option on the board. Chipotle breakfast is great. Having spent a lot of tome in Terminal B in IAD I just assumed every location served breakfast. Too bad because I've been jones'ing for it all morning. Bring breakfast to the masses chipotle - we'll eat it. breakkfast at Chipotle, the BEST idea ever! We already eat there for dinner 2-3 nights a week, the addition of breakfasst would send us there all the more often!!!!!!! !